Farmgirl Fare: Sunday Dose of Cute: Hey! What are you doing with our sheep? Not to worry, Marta and Daisy, they're just being sheared. Photos from Sheep Shearing Saturday 2012—which everybody survived just fine—should be up in a day or two. In the meantime, better beware of the big dogs. 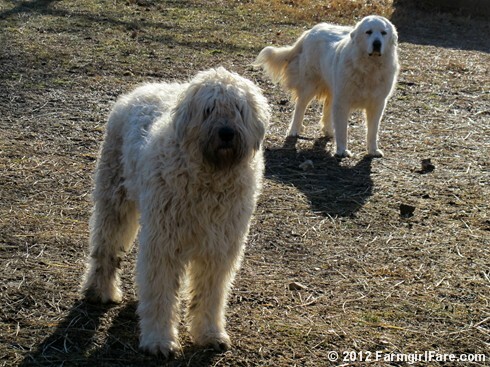 © FarmgirlFare.com, where sheep rustlers don't stand a chance—and can you believe how well Daisy cleaned herself up? There's nothing like a self-cleaning farm dog. And then there's Marta Beast, whose self-cleaning mechanism isn't quite 100% functional. Daisy got herself surprisingly clean!! Looking forward to "nekked" sheepie pictures! I'm sitting here in California with a cup of coffee, freezing this morning. I'm feeling for those sheep without their down jackets. I agree with gramps! Marta needs a new "do" as well!